TOL EU was great, thx to the casters, to the teams. Congratz to the winners aswm team, well played. Sadly I missed it live, but rewatched a few games today. That semi-final though.. best game I have seen for a while. You can have a look to Sins POV on his utube from the Finals. How often will ToL take place in a year? I am wondering why Anet doesn't utilize the special AT system even more. The 2v2 AT was great too and already several months ago. It is all already implemented, can't be that much work to open special ATs more frequently. And in the longer term also add few more types like 1v1 and 3v3 special ATs. Special ATs are easy produced content for PvP, why we only have them like 4 times a year (considering the current distance between the 2 special ATs we had until now). There could be a special AT each (or every second) weekend, switching between diffent types like 1v1, 2v2, 3v3, ToL etc. Only open the doors more often Anet pls. You can't get cheaper PvP content. Firebrand scourge spam is not great. I don't get the relation from your post to what i said. Yes it was. 2v2 would need separate balance but they said they won't do it, so I rather have them focus on 5v5 which is far more interesting than 2v2. We already had a fun 2v2 even though the balance was bad. They don't need to balance for each game mode. Different game modes have the nature that they can delete balance issues over the board because what is overperforming in one game mode might be useless or balanced in an other and vice versa. Also the other game modes are only special ATs not permanent content and for that don't compete with conquest in any case. Could you link it for us to see? It's ok for some modes to not be balanced as long as they're fun and spice things up a little from the usual 5v5 Conquest. Conquest would remain the primary mode that people actually tryhard in and the game is balanced around but doing some stuff outside of that wouldn't be bad for the game, and the systems are already there. Just look at how many game modes we had in GW1 PvP and honestly a lot of it wasn't "balanced" to say the least, I mean RA was basically \gg if your team didn't have a Monk and the enemy team did so it wasn't even just bad balance it was pure RNG a lot of the time, but it was still a fun casual mode to kill time in. Similarly there were other non-tryhard modes that the game wasn't really balanced around but that was ok. Regular 2v2 AT's, 1v1's, 3v3's, could be a straightforward deathmatch mode for all I care - choose whichever and however many of them you want, variety with game modes will do PvP a world of good especially to the PvP mains who can easily get burnt out on Conquest. Doesn't have to be tied to AT system either. Anet clearly agreed and tried something with Stronghold way back when but well, we don't talk about that. I agree, even if the balance is wonky in 2v2 and impossible to balance for since it will share balance with conquest etc. 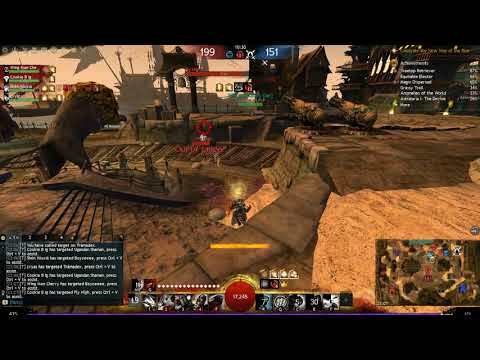 I still feel they should add 2v2 at's as a normal rotation, not only do I think it will lure PvE players but also WvW players to come into PvP and might even transition into conquest ranked Q.
I have no interest in Conquest anymore but would absolutely give 2v2 ATs a try if they became a normal thing. It's a lot easier to find one person to play with as opposed to a whole team. Would be a nice change of pace.